With over a decade of lending experience, LoanMart has created a service that can help you get the cash you need fast to cover any shortfall that may arise. Thanks to a strong emphasis on customer service and a dedication to helping you pay your expenses, LoanMart’s solutions give you the right amount of funds at competitive interest rates. With years of satisfied customers under their belt, LoanMart is a fantastic choice if you need short-term cash immediately. With their exclusive focus on auto title loans, you can work together with LoanMart offers to craft a repayment plan that works with finances. Terms are geared towards helping you close your debt within a short period of time, ranging from 12 to 36 months. If you have the funds to pay your loan off before the end of your term, LoanMart doesn’t penalize you for prepayment. Furthermore, all of your payments are reported to credit bureaus, giving you the tools to build or repair your credit score. 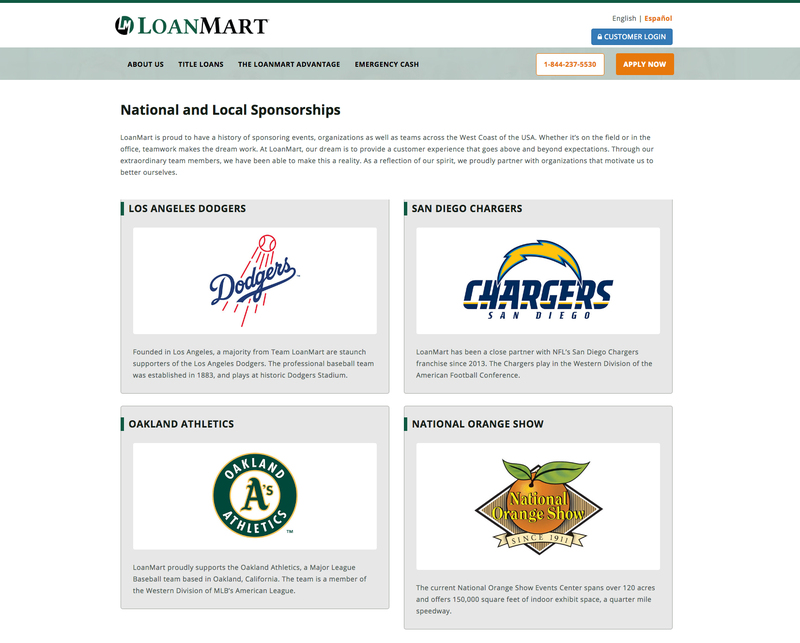 LoanMart could improve their services by offering more versatility in their loan options, but their specialized focus is designed to help you meet short-term funding needs. Although one of LoanMart’s benefits is the ability to use your personal loan for any purpose you wish, the drawback is that the loan is secured by the car. Because of the company’s strict focus on auto title loans, you can only receive funds based on your vehicle’s value. On the plus side, you can continue to drive your car while you pay off your loan, as opposed to a pawn loan or more restrictive debt. Additionally, LoanMart does not set a maximum loan amount and allows you to borrow up to 100% of your vehicle’s value. However, loan amounts may vary according to state laws. Finally, if you need emergency funds, you can take a signature loan of up to $2,500. When signing up for your loan, you are eligible to receive highly competitive interest rates—ranging from 30% to 222% APR. These rates are designed to fit your lifestyle and income to help guarantee that you can pay off your debt without harming your credit and future finances. After approving your application, LoanMart looks at more than your credit score to determine your ability to pay off the loan. The company will analyze your car’s equity as well as your current income to help determine the best payment plan and loan amount for your needs. LoanMart also understands that sometimes a credit score is not a good indicator of your ability to pay for a loan. Therefore, you can receive funding even if your credit score is weak or non-existent. If you need more information or are uncertain about the lending process, LoanMart’s website can be a very helpful resource. In our experience, the company’s site offers a helpful FAQ that answers most questions while giving you a valuable overview of the different borrowing choices available if you are looking for a quick loan. LoanMart could add more detail to their loan product descriptions and discuss how borrowing can impact your credit score over the long-term, but overall provides a strong basis for understanding your options. If for any reason you cannot find answers on their site, LoanMart’s dedicated customer support is available seven days a week. 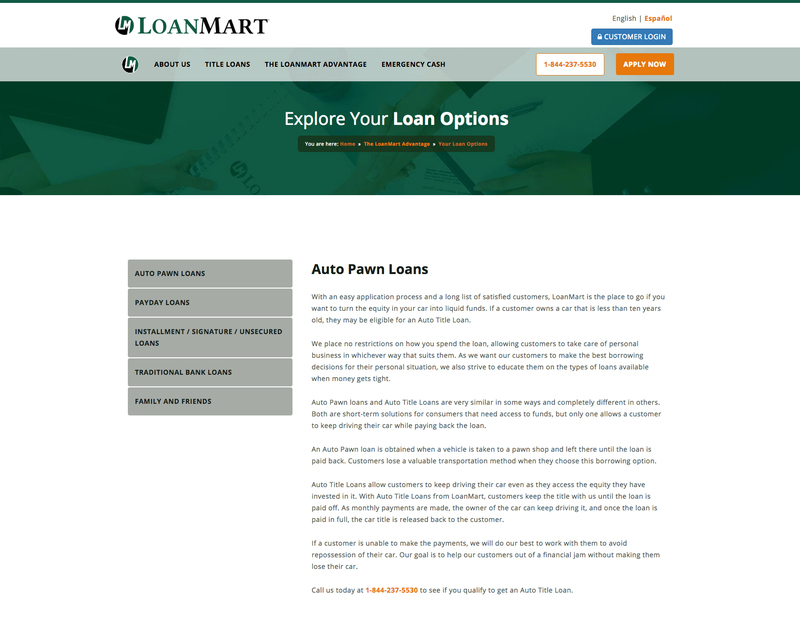 When you decide to get started, applying for a LoanMart loan is a very straightforward process. You can complete your application online, via telephone, or even in-person with one of over 1,000 licensed LoanMart agents. The process is easy and does not require any sensitive personal information. You are, however, required to present some basic documents including a government issued photo ID, your car title, proof of income, and proof of residence. With over a decade of lending experience, LoanMart is a reliable partner and an expert in the auto title lending space. Despite some small shortcomings, LoanMart more than compensates for its drawbacks with excellent service and accessible borrowing that can help you get the funds you need quickly. LoanMart’s superior customer service and a straightforward application makes it easy to start borrowing and stay on top of the loan process so you can always be in control of your finances.